A complete guide to the 8 best rooftop bars in Budapest in 2019. 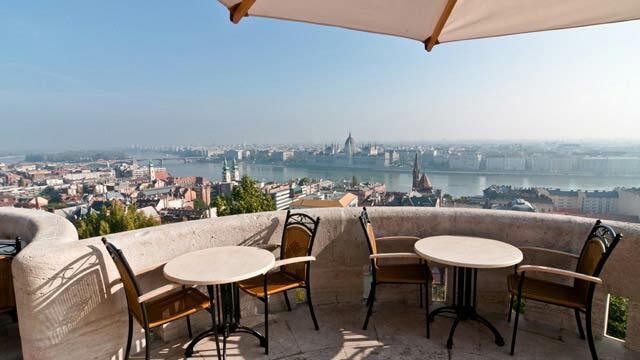 For starters: Which are the best rooftops in Budapest? 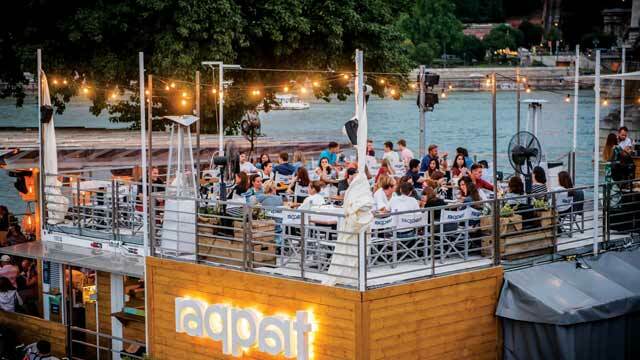 It doesn’t matter if you find yourself strolling the beautiful streets of the Buda or the Pest side, both host some of the best Budapest rooftop bars. 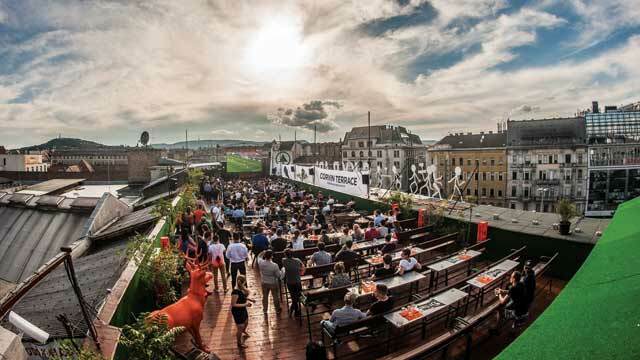 To know where to stop for a drink, check out this guide to the best roof terraces available in the capital of Hungary. Here you'll find with all info you need about each rooftop. Opening hours, dress code, pictures, maps and much more. 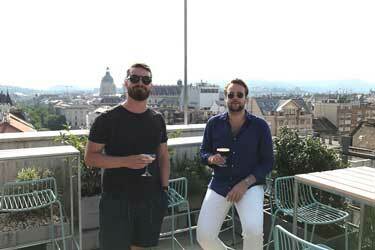 So, which is the best rooftop bar in Budapest? 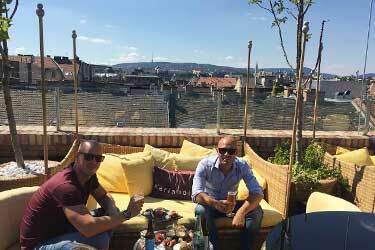 Just scroll down and find the Budapest rooftop bar best suited for you. Or use the Budapest rooftop map in the bottom right corner. 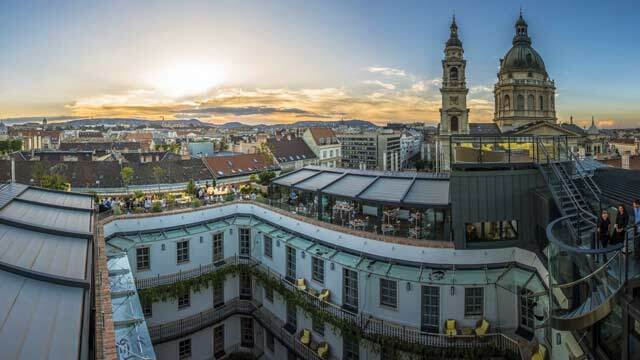 An amazing rooftop bar, located at the equally fantastic and world-renowned Aria Hotel Budapest, right next to the famous St. Stephen's Basilica. Open all year around, the roof terrace is decorated as a large roof-garden with the opportunity to eat, drink, sunbathe, relax and just enjoy the sweeping views of Budapest and cool close up views of St. Stephen's Basilica. 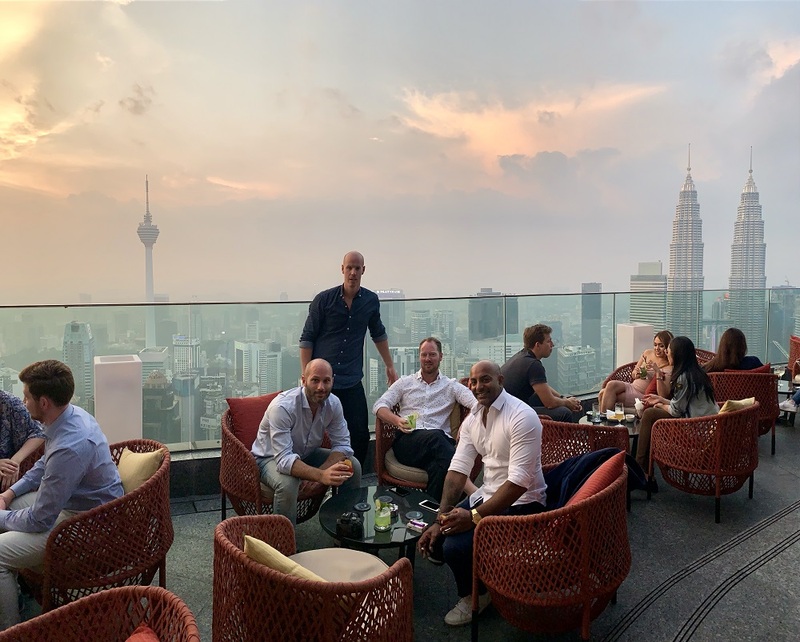 With great service and a sophisticated but relaxed vibe, the rooftop bar offers both lunch, tasty bar bites and signature cocktails created to perfection. This relaxed and urban rooftop bar, located in the central part of Pest, have perhaps the very best view of any Budapest rooftop bar. 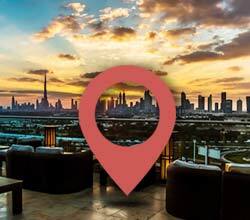 Sweeping 360-degree vistas, perfect for some relaxing and well made cocktails while taking in the city. The terrace is large and very open air, bathing in sun from morning until night. Quite simple in decoration but with fresh colors and alot of grenery, creating something of a "park-feel". Eventful rooftop bar with lots going on both day and night, like live DJs and artists performing or rooftop yoga with brunch. 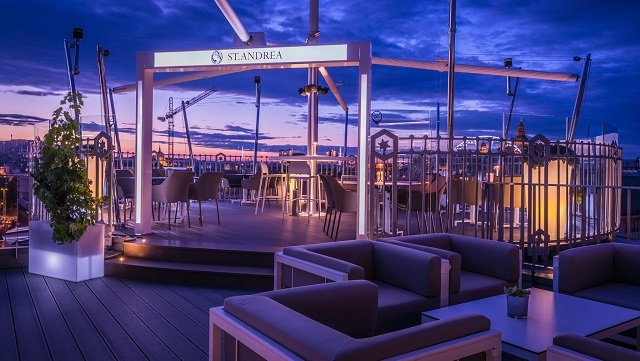 St. Andrea Wine & Skybar is a superb and very elegant rooftop bar in Budapest, open all year around. The terrace is perched on top of one of the most attractive buildings at the Vörösmarty square, offering fantastic skyline views over Budapest. The stylish and posh setting is also highlighted in drinks and food, with the rooftop bar offering extremly well crafted signature cocktails and special bar food dishes created by an internationally acknowledge chef. And of course, given the name, a large selection of fine wines. Definitely not your ordinary rooftop. Located on top of an old Soviet rock carrier ship, this is not only a rooftop bar but also a restaurant, concert venue and exhibition space. Not that high in altitude, but the terrace still offers superb panoramic views of the Southern Pest the Liberty Bridge. 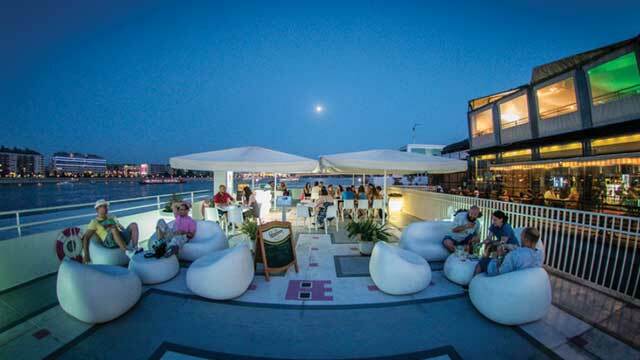 The rooftop bar has a nice selection of assorted beverages and the restaurant very good local and European food, but the best thing about A38 rooftop is propably the great atmosphere, and the chance to see live DJs and many well-known bands and artists perform. Mostly famous for being an awesome underground club, with techno music, live DJs and and a great party well into the night (morning). This goes on year round in the basement club, but during the warmer months the party also moves on up to the rooftop. 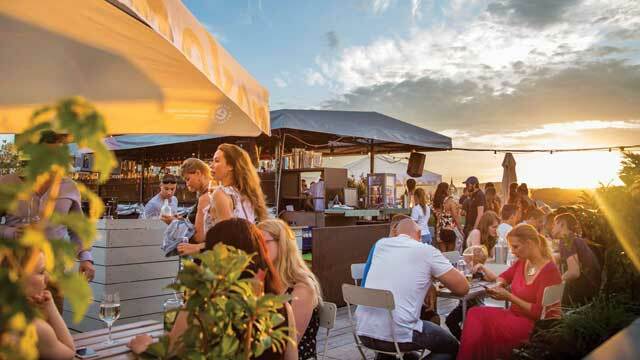 And as a bonus, the rooftop terrace also hosts more daytime/early evening summer events every now and then, like rooftop cinema, BBQs and major sport events on a big screen. A deluxe ruin bar with great views over the city. Gozsdu Sky Bar's main feature might be the location. Not only in downtown Pest’s District VII, but also inside the Gozsdu Udvar. This historic building complex hold many of the city's most popular bars and restaurant, all tucked away in a cool and cosy myriad of adjoining courtyards. And in the labyrinth you find the 6th floor Gozsdu Sky Bar. An unpretentious rooftop bar, quite simple in decor and setting, but with cool views over the Budapest rooftops and the Citadella at Buda side. Popular weekend party-spot vibe for the younger crowd. Calling Raqpart a rooftop bar might be a bit generous, but thanks to fantastic views and a second floor open terrace, it is ok. Since it also comes with a small private beach section it is even more ok. This summer hot-spot is located right by the Pest-side bridgehead of the Chain Bridge and offers lovely views over Donau and the bridge. 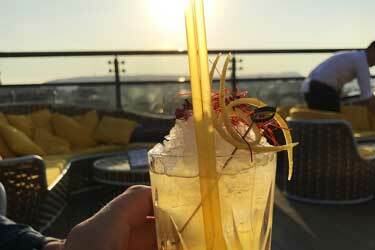 The rooftop bar offers 'Lemonade for adults' and alcoholic smoothies, along with classic cocktails, wine and sparkling. Come early to enjoy sunny drinks and relaxing river views, or at night for live DJs, great vibes and a large crowd. The Fisherman's Bastion is probably more known as an historic Budapest tourist attraction than as a rooftop bar. This majestic seven tower castle on the hills of Buda does however work as both. Here you find a restaurant serving classic local cusine in a beautiful castle setting, along with a rooftop terrace serving refreshing drinks during summer, but that is also heated and open for warmer beverages during winter. All this to absolutely amazing views over the Donau and the Buda side of town, perfect for an unforgettable and romantic night. Discover the biggest collection of Budapest activities, guided tours and skip-the-line tickets. Anything you want you'll find right here. 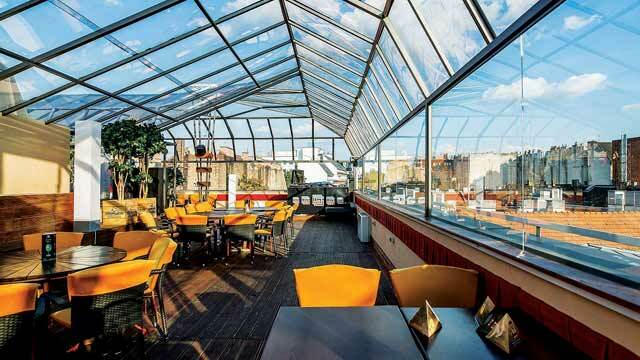 Budapest has a variety of rooftop bars with absolutely stunning views. 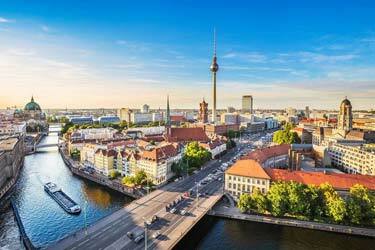 It is a good idea to visit these places during spring or autumn when the climate probably is the most pleasant. 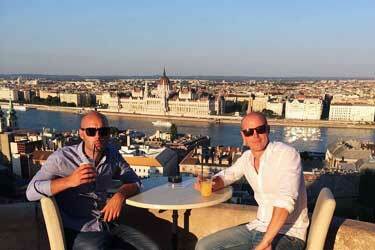 Most of the rooftop bars in Budapest has a fantastic view over the city skyline. Budapest is Hungary's capital since 1873 when the three towns of Buda, Pest and Óbuda merged into one city. 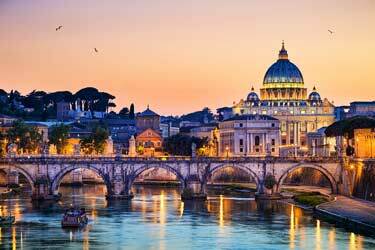 The city is centrally located in the country on both sides of the Donua river. 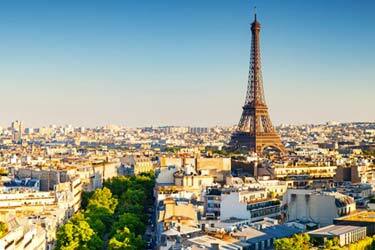 Some of the city's tourist attractions are the Great Market Hall, the hot springs, museums and historic buildings.